Here’s a follow up to last week’s post about the American Bar Association ethics opinion distinguishing between “puffing” on the one hand and “false statements of material fact” on the other in caucused mediations, and which bestowed its blessing upon the former but not the latter. This week’s edition of Blawg Review links to a post on the Psychology of Compliance & Due Diligence Law blog about a new book for the legal profession, Lawyers’ Poker : 52 Lessons that Lawyers Can Learn from Card Players. Great poker players are master tacticians. Not only do they calculate odds with lightning speed and astonishing precision, but they also cunningly anticipate and manipulate the actions of their adversaries. In short, they boast skills that every lawyer can envy. This highly entertaining work might best be summed up as “better lawyering through poker.” Steven Lubet shows exactly how the tactics of the poker table can be adapted to litigation, negotiation, and virtually every aspect of law practice. In a series of engaging and informative lessons, Lubet describes concepts like “betting for value,” “slow playing,” and “reverse bluffing,” and explains how they can be used by lawyers to win their cases. The best card players, like the best lawyers, have a knack for getting their adversaries to react exactly as they want, and that talent separates the winners from the losers. When I consider the preceding passage together with the recent ABA ethics opinion, some questions for lawyers, negotiators, and mediators come readily to mind. Let me say first that as someone who enjoys a good card game (and in fact married my husband in Las Vegas), I have nothing against poker, cards, gambling, winning, losing, or even using those analogies in describing litigation tactics or outcomes. 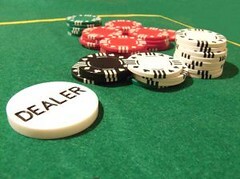 In fact, gambling metaphors lend themselves very nicely to depicting the risks inherent in litigation–it’s the leverage that mediators use when we urge parties to weigh their alternatives. But should we attorneys and negotiators rejoice to hear these metaphors applied not only to litigation but “virtually every aspect of law practice” including “negotiation”? Are we truly supposed to believe that skill in “manipulating the actions of their adversaries” is a virtue that “every lawyer can envy”? As for mediators, if mediation is, as we like to say, “assisted negotiation“, is this the kind of negotiation we want to be assisting? What does it do to public confidence in mediation if we allow parties to “puff”, bluff, and manipulate their way to settlement, even if it does have the ABA’s seal of approval? We still have a responsibility to the process, to our profession, and to ourselves. Otherwise, in the end, everyone loses. And is that a gamble mediators should be willing to take? This entry was posted in Legal Issues, Mediation, Mediation Ethics. Bookmark the permalink. Steven Lubet’s book will be very valuable to mediators and negotiators. Even though poker is a zero sum game, every mediator or negotiator faces a zero sum game: can we find the zone of agreement? Where Steven’s book is valuable, and this is what I concentrated on in my review on bizop.ca, is that every negotiator has to figure out how strong the other party believes his own case is, how strong I believe that the other party’s case is, and various permutations of the “recursive reasoning”.No less an authority than the Nobel Prize Winner Professor Thomas Schelling has also endorsed Lubet’s characterization of a lawyer has someone who has to solve the “recursive” reasoning problem Poker gives very clear examples of how to solve this strategic thinking.Steven Lubet doesn’t claim that all lawyers need to know can be learned from poker players, but he does provide clear and compelling examples of how poker players think strategically and his legal examples are enlightening.Generally, I would characterize Steven Lubet’s book as a contribution to that part of cognitive science which focuses on the interaction between hueristics and rational thought in decision theory. And as such it is both unique and valuable.